Here is one solution to the rising cost of college: Make it free. That’s what a group of anonymous donors in Kalamazoo, Mich., accomplished a decade ago for local students. Almost every high school graduate in the town is eligible for a scholarship covering from two-thirds up to the entire cost of in-state college tuition. President Obama is just one of many who praised the so-called Kalamazoo Promise, flying to the city five years ago to speak at the Kalamazoo High School graduation. More than 35 cities, from Denver and Pittsburgh to Ventura and Long Beach, have since adopted their own versions of the Promise. These schemes vary. Some have minimum GPA requirements, or target only low-income students. But they share the goal of bringing college within financial reach for all. Can the Promise programs help create a more level playing field? The Kalamazoo program is now mature enough to provide some useful data. As always, there is good news and bad news. First the good: High school graduation rates have shot up, and almost 90% of Kalamazoo high school seniors are enrolling in college, compared to around 70% for the state. Most encouraging of all, low-income and black high school graduates are almost as likely to enroll in college as their affluent and white peers. In fact, the black/white gap in college enrollment rates has completely disappeared in Kalamazoo, according to research from Timothy Ready at Western Michigan University. Now for the bad news: Gaps by race and income reemerge when it comes to actually gaining a post-secondary qualification. The Promise has lifted college completion rates, but quite modestly, and far from equally. The generous donors behind the Kalamazoo Promise are all anonymous — a far cry from having a football stadium or a new business school named after oneself for legacy’s sake. These folks didn’t want their names out there; they helped anonymously. Very cool! What is true is that if one compares the present value of the expected future career earnings due to the Promise’s effects on credential attainment, with the present value of the costs of the Promise’s scholarship dollars, the ratio is over 4 to 1. I would call that a large benefit-cost ratio. 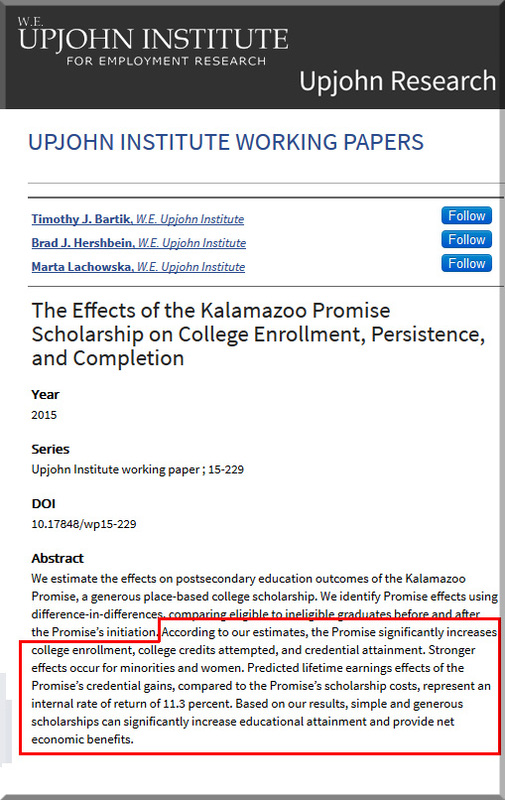 The Promise “significantly” increases college graduation rates. The increases are evident among low-income and minority students as well as more advantaged students. Promise-eligible students are 40 percent more likely to choose in-state public colleges compared with pre-Promise peers. Compared to pre-Promise peers, Promise-eligible students are a third more likely to attend a four-year college. The long-term payoff of The Promise is significant, and easily justifies the cost of the investment. The results are especially impressive because Promise scholarships are not awarded on the basis of financial need or merit.